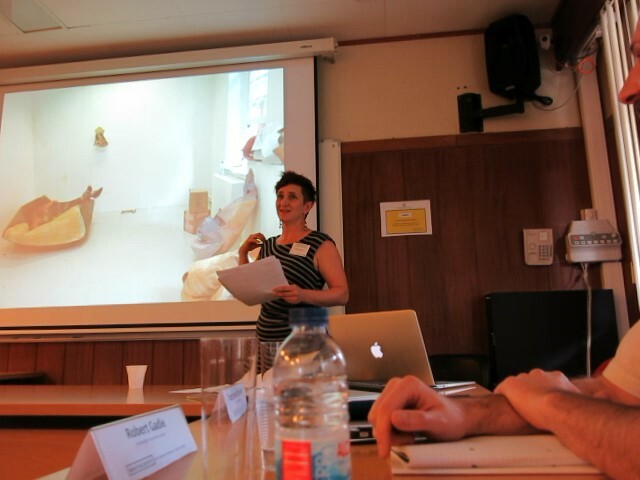 CCW Graduate School doctoral students Stephanie Spindler and Robert Gadie recently presented papers at Mind the Gap: The Artist in Culture Studies, 5th Graduate Conference in Culture Studies, School of Human Sciences, Catholic University of Portugal, 2nd – 3rd November 2015. Taking as a starting point Hal Foster’s essay The Artist as Ethnographer? (1995), this conference aimed to bring together doctoral and post-doctoral students working within disciplines that relate to the study of culture (arts, humanities and social sciences), and establish a forum for stimulating debate. The keynote speakers included Laura Mulvey (Birkbeck College, University of London), Jean-Francois Chougnet (Director of the Musee des Civilisations de l’Europe et da la Mediteranee, Marseille), Isabel Capeloa Gil (Vice-Rector at UCP/Director of The Lisbon Consortium Programme), and Ruth Rosengarten (Artist/Writer/Curator, Research Associate at University of Johannesburg). Spindler presented a talk entitled A Shift in Weight in which she talked about her artistic practice and the components of her research. Her objective was to show how the theory and practice were integrated and how through the activity of the practice questions were generated that would enable her to resolve her research question. Gadie presented a paper titled The artist as a liberated producer of knowledge? He considered two early examples of artistic-research (academic research done by fine artists), and questioned how they adhered or reacted to, normative conceptions of knowledge production. This allowed for the articulation of a methodological problem caused by a conflation of the context of discovery and that of justification, in which a similarity can be noted between kinds of artistic-research and kinds of ethnography. By comparing these ways to do research, Gadie elaborated the cost of being ‘liberated’ from a disciplinary account of knowledge production. This entry was posted in Students and tagged 5th Graduate Conference in Culture Studies, A Shift in Weight, artistic practice, liberated producer of knowledge, Robert Gadie, Stephanie Spindler, The Artist in Culture Studies on November 20, 2015 by Claire.